I’ve been obsessed with Peplum jackets for a while now. I bought this beautiful beige peplum jacket on one of my trips to Istanbul. The long brown maxi skirt, I found at a market place in Manila called, Green Hills. It’s shopping paradise for any fashionista and the prices are a steal ! What more can a girl ask for ? The beige ballerinas were also another great find at a local market stall in Manila. I guess that’s why I travel a lot , simply to shop and find lovely goodies ! 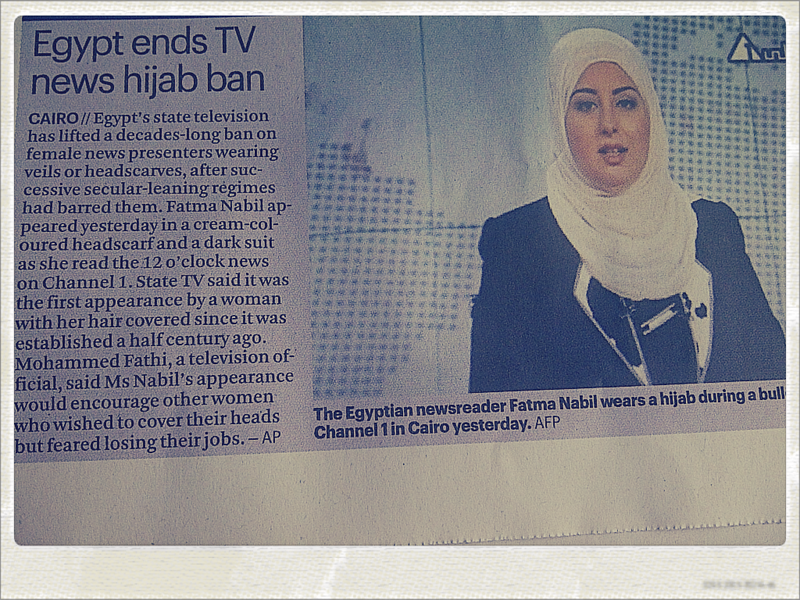 Read this article yesterday in our local newspaper, The National, and was surprised that even in a country with one of the strongest Muslim populations, Egypt, actually had a ban on female presenters wearing the hijab ! As today is World Hijab Day, I just wanted to give a big salute to all the Muslim women that are struggling with their decision to wear a hijab, and for those against all odds who have put it on, and still have to face obstacles and struggles within their communities, work and social circles. Even women that do wear the hijaab in Muslim countries do face criticism and skepticism in certain areas of employment, so for all the hijabi sisters in Western countries, please know that you are not alone. Yes, we are the ones pulled aside for security checks at the airport, and yes, we’ve all been asked if we ‘feel hot’ with it on, but this is a personal struggle between us and our obligations as a Muslim woman. This is our jihad. I won’t deny and say I haven’t had one of those days where every now and then I just want to walk out my door, where like a Pantene advert, I’m swishing and swaying my hair out. Keeping our hair and our body covered can sometimes be difficult especially when everywhere you go, there’s not one form of media that shows a beautiful hijabi. But, that’s just a thought, a tiny thought, and as soon as I start to wrap my face with that cloth that signifies me as a Muslimah, I see my true beauty from within. And there’s no media, no magazine, no TV show, that can give me the peace that I have within, knowing that I am representing a beautiful religion, and that this personal sacrifice, isn’t really a sacrifice, if all it does is bring me closer to my Creator. Keep your head up, stand tall, and wear that hijaab proudly ! Happy World Hijab Day ! Using a plain purple chiffon hijaab with a crusted bow head band I found in NYC in Korea town. Just make sure you use a bonnet before putting on a chiffon hijaab as they tend to slip off quite a lot. I love accessorizing my outfits with lots of jewelry. 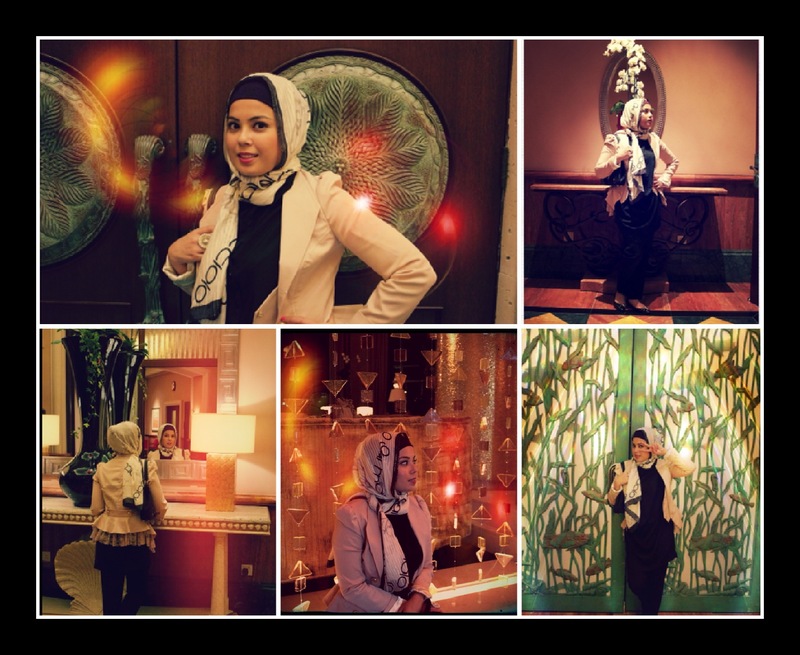 Don’t be intimidated by using brighter colored hijaabs with darker plain outfits. It adds an interesting touch to the overall look. These are Limited edition Sam Edelman shoes that I got for a steal @ the Bloomingdales sale in DXB Mall. I couldn’t believe they actually had a pair left in my size, 5 1/2 ! Yes, I’ve got tiny feet !!! This dress is one of my fav’s ! It was one of my great finds during the DSF sale – yes I love getting a bargain! It’s a classy black mid length dress that I got from OASIS. I can usually find lots of full length dresses and tops that are modest yet still flattering.